Becoming a counselor is a significant investment, of both time and money. All states require a professional counselor to have at least a Masters degree, as well as complete many hours of supervised work as an intern before applying to sit for the state board exams. Counselors work with many different people from all walks of life, meaning that the client pool is diverse, as are the types of counseling jobs available. Determining compensation once you have your Masters in counseling depends on several different factors including area, specialty, employer and benefits packages available. According to US News, a mental health counselor can expect to make an average of $39,000 per year. The best paying counselors earned approximately $65,000 a year, and the lowest earned about $24,000 annually in 2011. The 75th percentile salary for employment in 2011 was $50,000. It is nearly impossible to figure out how to compare how much a Masters degree will add to your salary, as it is illegal to be a counselor without having completed your Masters in Professional Counseling or Marriage and Family Therapy. While the salary for counselors may be a little underwhelming for the amount of education required, the job prospects for counseling professionals is good. The Bureau of Labor and Statistics (BLS)projects that the number of counseling jobs available will increase by 36% over the next decade. This is due primarily to the fact that the cost for psychologists and psychiatrists has risen, and insurance companies are looking for a more affordable alternative for their clients. This positive job outlook shows that while counselor salaries are not high, they are stable and will continue to be stable or grow in the next decade. 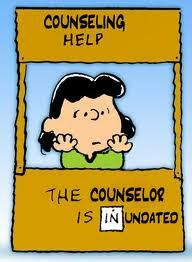 There are several potential benefits to being a counselor that are not financial, but lifestyle related. Many counselors open a private practice, meaning that they are in charge of their schedule and employees. While this also means more responsibility, the freedom and flexibility associated with owning your own business is a huge perk. Many counselors who choose not to open their own practice will work for the state or local government. The salary for these jobs is stable, the retirement package is typically very good and government workers are entitled to many holidays that most workers in the private sector are not. Becoming a professional counselor will not guarantee unending riches, but it can lead to a comfortable life with flexibility, stability, or both, depending on the path that you choose for employment. The field of counseling offers many different specialties, such as substance abuse counselors, school counseling and group counselors, and this variety offers counseling professionals the ability to become competent in many different areas should one area lead to burnout. Earning a masters degree in counseling will provide the foundation you need to get into a growing field with bright job outlook and a comfortable salary that can support you.